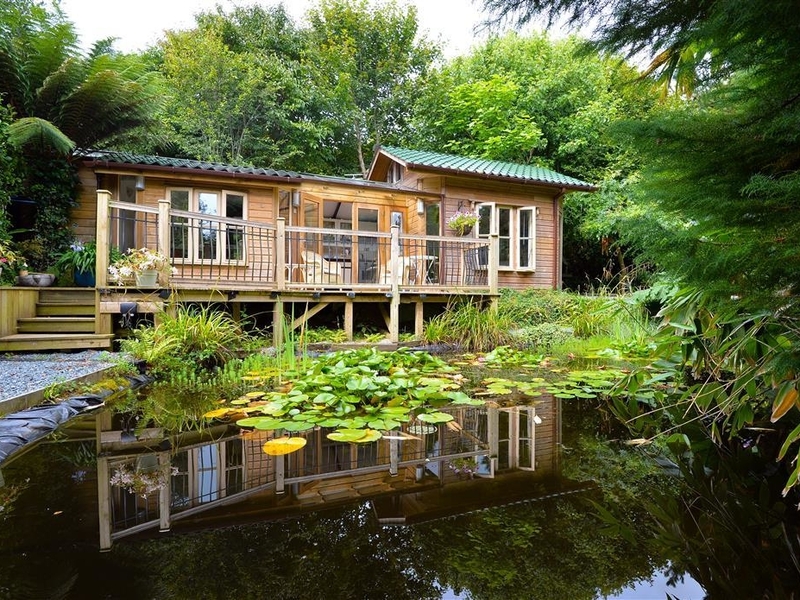 The Tea House is a ground floor detached lodge located in Ludgvan, Cornwall. It overlooks a lily pond and stands on a four acre garden, full of exotic plants and shrubs. There is one double bedroom with an en suite wet room and can sleep two people. They have a living room with opens onto a patio, along with a fitted kitchen and dining area. The patio leads to a large decking area overlooking the lily pond and has patio furniture. There is access to a secluded driveway for parking and complimentary tours are available. The Tea House is the place for a secluded romantic vacation. Central heating. Oven, fridge, microwave, washing machine. TV, DVD. Bed linen and towels inc in rent. Off road parking. Large deck with cane furniture overlooking pond, patio. Shared picnic table and granite seat by the entrance with fine views over a wild valley. Shared access to owner's superb sub-tropical garden. Sorry, no pets and no smoking. Pub and shop 1 mile. Note: This property is not suitable for young children, other than babies in arms.